The governor orders the purchase of 35,000 doses of overdose-reversing naloxone; integration of medication-assisted treatment into the criminal justice system; and creation of a statewide network of 250 recovery coaches. AUGUSTA — Gov. 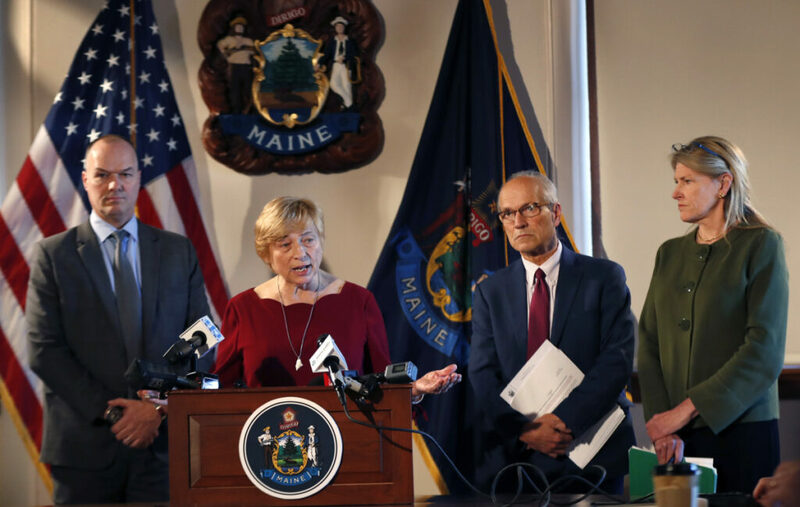 Janet Mills signed an executive order Wednesday outlining immediate steps her administration will take to combat an opioid crisis that continues to claim more than one life each day to overdose. 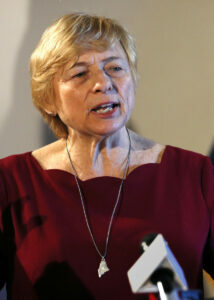 Speaking from her Cabinet Room, the Democratic governor shared details of the order, which include: purchasing 35,000 doses of the overdose-reversing drug naloxone, or Narcan, and distributing them throughout the state; integrating medication-assisted treatment into the criminal justice system, including jails and prisons; and creating a statewide network of 250 recovery coaches, including 10 full-time coaches assigned to hospital emergency rooms, who will guide people as they navigate their own struggle with substance use disorder. The cost of the order is $1.6 million, Mills said, and will be paid for with existing resources, including federal grant money that had not yet been used. Mills also directed her administration to better assess what’s working and what isn’t and to create a statewide map using several data sets that can help identify where the opioid crisis is hitting hardest and direct resources there. “People say, ‘How can you afford to do this?’ I say, how can you afford not to,” the governor said. Mills was joined by two Cabinet members – Health and Human Services Commissioner Jeanne Lambrew and Corrections Commissioner Randy Liberty – as well as Gordon Smith, whom she picked last month to serve as the state’s first director of opioid response. Just a month into her term, Mills already has indicated that her approach to tackling the opioid crisis will differ from her predecessor, Republican Paul LePage, both in substance and in tone. She said with at least 1,630 overdose deaths in the last five years and 908 babies born drug-affected last year alone, the time to act is now. With Democratic majorities in both the House and Senate, she may get a chance to accomplish more, either through legislation, the budget process or both. Republicans have said they agree that the crisis needs to be a top priority, but they plan to challenge her on any major spending increases. Mills did not say Wednesday whether her proposed two-year budget will include additional funds to address the crisis, but did say that her administration is finding money from the previous administration that hadn’t been used. She also said that she plans to propose lifting a 24-month cap on medication-assisted treatment for Medicaid recipients, a LePage-era restriction that many advocates said was arbitrary and harmful. It’s not clear how many Mainers have been removed from medication-assisted treatment since that went into effect. Smith, who spent many years as the top lobbyist for the Maine Medical Association, said he’s working to increase the number of doctors who have the necessary federal waiver to administer Suboxone, the most common medication used in medication-assisted treatment. Much of what Mills has announced so far on the opioid crisis already has been done in other states. Vermont has had success since it expanded treatment options and created a “hub-and-spoke” model to better steer people to the type of treatment best suited to them. This is Mills’ second executive order. Her first, signed the day after she was sworn in, ordered the immediate expansion of Medicaid, something voters had approved through referendum in 2017 but which LePage refused to implement. Those who have been able to sign up for government-run health care now have access, among other things, to an array of treatment options for substance use disorder. Lambrew said it’s too early to tell how many of the more than 3,000 new Medicaid enrollees are accessing treatment, but she said there is no question that states that have expanded Medicaid in recent years have had more success. Liberty said that although he hasn’t identified any additional funding in the Corrections Department, he does plan to continue with pilot programs that provide medication-assisted treatment to inmates at Maine State Prison and hopes to expand that to the Maine Correctional Center in Windham and Mountain View in Charleston. He also said he plans to visit Rhode Island, which has had success expanding medication-assisted treatment into its correctional facilities. “Many of our community-based behavioral health agencies have been creatively pulling together scarce resources and private grants to start programs such as rapid access MAT induction in emergency departments with connections to home and community follow up and treatment, such as is happening in Lewiston and elsewhere,” she said. “It is heartening to see an investment of state dollars in these efforts as well. Democratic House Speaker Sara Gideon of Freeport also commended the order. “Her outline of immediate action to increase prevention efforts, expand access to effective, affordable treatment and, increase access to programs that support people’s long-term recovery will have a direct impact on thousands of Mainers,” Gideon said in a statement. A joint statement from Maine House and Senate Republicans called for a bipartisan approach. Mills said her executive order is just the first step in addressing the ongoing crisis. She plans to continue working with her cabinet, with the Legislature and with the public health community to identify other possible steps. “These actions will save lives, will help protect our children and young adults from the appeal of dangerous drugs and will ensure that Mainers suffering from substance use disorder in our emergency rooms, in our jails or on our streets find the resources they need now to recover and rebuild their lives,” she said.